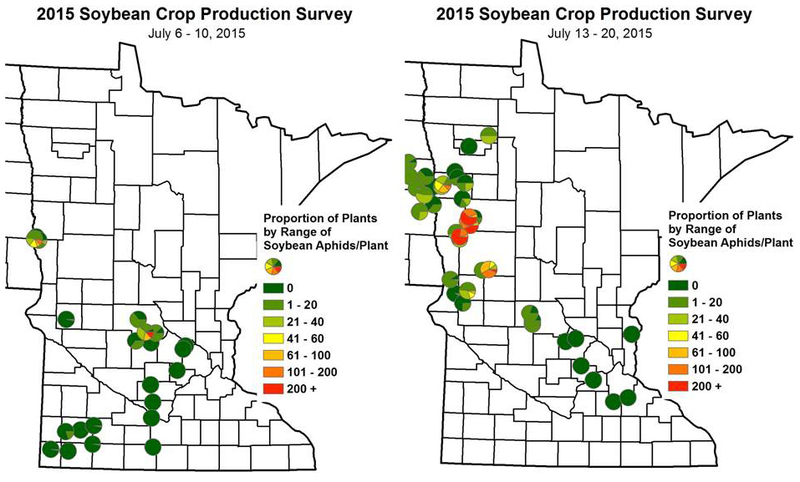 Soybean fields are being scouted in the region, with particular emphasis on soybean aphid and how populations are establishing and increasing. Though field populations of aphids are quite variable, populations certainly are increasing as we would expect for this time of year. The majority of the fields we've scouted in the past two weeks were averaging under 20 aphids per plant HOWEVER we did have a few fields average from 50 - 60 aphids plant. 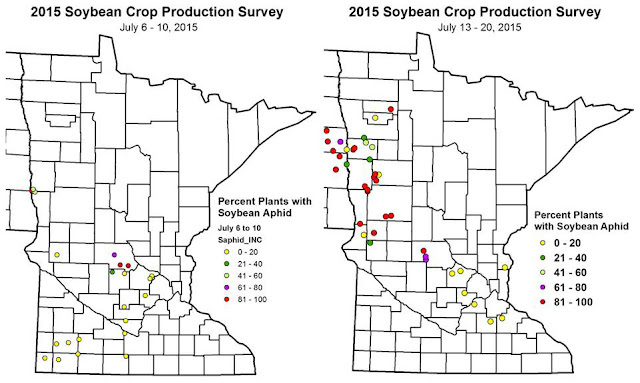 In fields with these greater averages, the percent plants with aphids present were in the 90+ % range. Also within those greater number fields, we are finding randomly selected plants reaching into the 200+ aphid counts, though those plants represented only about 15% of the total plants randomly selected at individual sites. 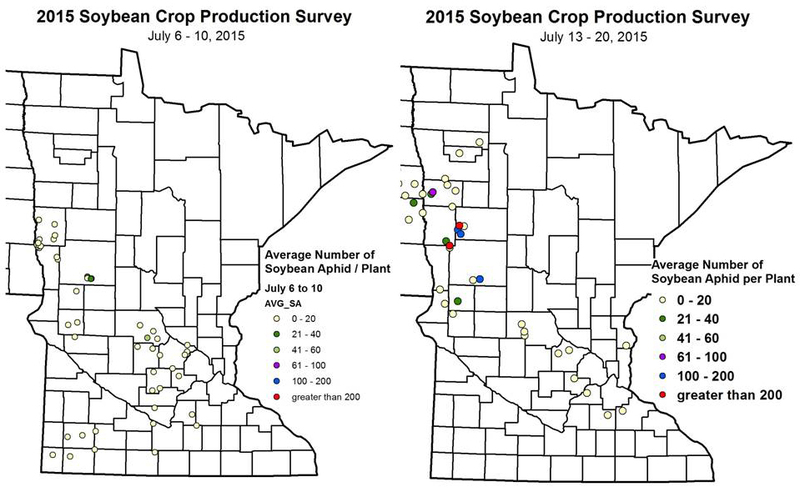 There are reports of fields having already been treated in central and west central MN, as well as threshold levels reported in SW MN (see Southwest MN IPM Stuff No. 12, July 16, by Bruce Potter, IPM Specialist, SWROC - Lamberton). The scouts have not randomly selected any fields in their travels that are at threshold levels. Remember, it is a numbers game at this point. If treatable fields are not being found through a random-like selection process, then treatable fields represent only a small percent of the fields. Keep in mind, the vast majority of fields were still well below threshold. Scouting fields should begin in earnest to establish your baseline infestation and then be able to track aphid progress over the next 4 - 6 weeks. We are at that time of year when things can progress quickly, so pay attention. Also, avoid spraying early. To understand some of the concerns with treating too early, read the article The Downside of Insurance Insecticide Applications for Soybean Aphid. Here are some of the mapped summaries of scouting activities. The first two maps summarize Percent Infested Plants from the previous two weeks. 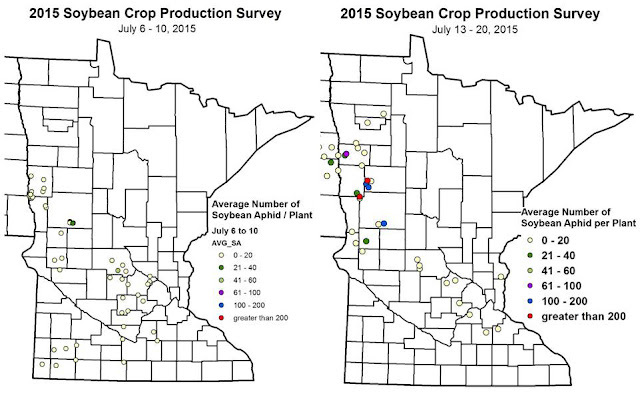 You can note even a few fields had reached the higher percent categories by July 4th. There will be more fields reaching those levels last week. 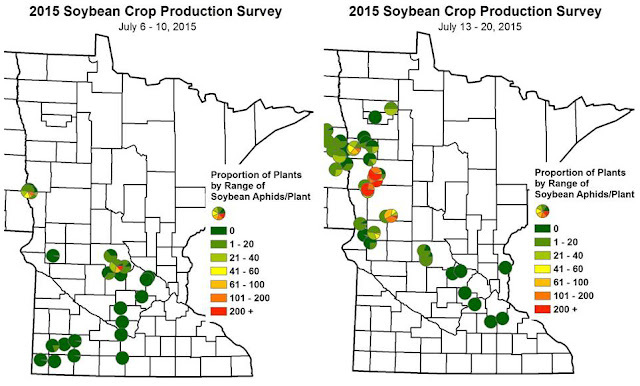 The second set of maps compares the previous two weeks for the Average number of Aphids/plant when found last week. 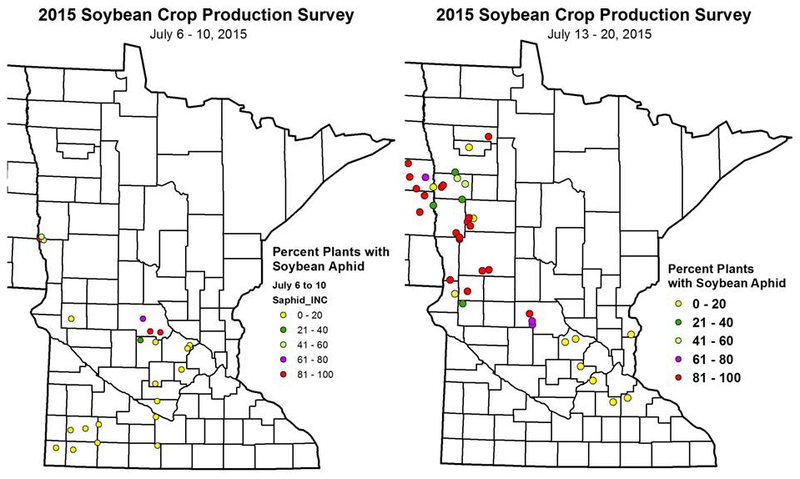 These maps will be updated as the new data is submitted over the weekend. Finally, the third set of maps presents a breakdown of infestation levels with in the fields by Proportion of Plants whose Aphids Totaled within the given range. Note that we are now finding fields whose populations are reaching threshold numbers. The protocol being used in the project is to have scouts select fields at random, trying to space them a minimum of 10 miles apart. When in the field, scouts select plants at random while making a large circular path through the field. When a plant is selected, scouts do a quick assessment and record whether aphids are present on the plant (% Plants with aphids or Aphid Incidence), a classification of the plant by the range of aphid counts (Ranges are: 0, 1-20, 21-40, 41-60, 61-100, 101-200, or greater than 200), and calculate an estimated Average # of aphids per plant based on those classifications.